Hi all! I’m back with my second card for Day 4 of Stenciled. Just like with the previous card, I cut my own stencil using a Heart Nestabilities die and then used the Flourish Impressabilities. This time is just used pink and red inks and then finished off the card with glitter chipboard letters and black sequins from Darice. I hope you like it and TFL! I made my own butterfly stencil by cutting a Spellbinders die from a piece of acetate. The second stencil is also from Spellbinders - the Flourish Impressabilities. I used a rainbow of Distress Inks and then finished it off with the Thanks die – cut 3 times and glued together and covered with clear Wink of Stella and then Glossy Accents (just like Jennifer did in her video). I absolutely LOVE this technique and have another card to share a little later! TFL! For my stencil, I used one of the Carta Bella Hello Again Element Stickers and sponged over it with Spun Sugar and Festive Berries Distress Inks. Then I stamped sentiments from Many Thanks and added a small Swarovski crystal. Finally I mounted it on a white card base. This is also for the Little Red Wagon challenge – Clean & Simple. I hope you like it and TFL! I used the Moroccan stencil from SSS and stamps from Starry Night and Giving Thanks. I sponged on Spun Sugar and Picked Raspberry Distress Inks and added some zigzag stitching and Teal Gumdrops. Finally I stamped a sentiment from Sentiment Sampler on some Office Depot vellum that I die cut using the Fishtail/Banner die set. I hope you like it and TFL! I used the Graduated Dots stencil from MFT and a whole bunch of different InkTense pencil colors. The sentiment is from Word Salad and was embossed with Hero Arts white EP. Finally the sequins are from Studio Calico. I hope you like it and TFL! I used the same stencil as the last card (On the Diagonal) but the technique gave it such a different look! Love it and never would have thought to do it without the class! I added a sentiment from Pretty Phrases and some Black Gumdrops. The Distress colors I used are Salty Ocean and Squeezed Lemonade. I hope you like it and TFL! The stencil is called On the Diagonal from MFT, the thanks die was cut 3 times from black cardstock and layered together, and the For Everything is from Many Thanks by Mama Elephant. The sequins are from Darice. I used Memories Mists to spray through the stencil and coated the die cut with a clear Wink of Stella pen. Hope you like it and TFL! Hi all! 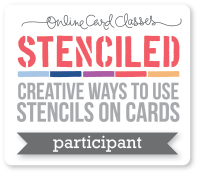 I’m taking the online class Stenciled right now and loving it! I’ve recently gotten into mixed media and stencils so this was the perfect class for me! I used the Petal Pattern stencil from MFT and Shaded Lilac and Dusty Concord Distress Inks. The sentiment is from Sentiment Sampler and the sequins are from Neat & Tangled. The vellum is from Office Depot and I used Hero Arts white embossing powder over Versamark ink. I hope you like it and TFL! I used a bunch of different YNS products for my card: Cute with Wings Dress Up Fhiona (face, wings & antenna), Furry Dress Up Fhiona (body) and the matching dies for both sets, Must Have Borders Die Set One (heart border and hearts on antenna), Love Bug Sentiments and Strawberry Gumdrops. Fhiona was stamped with Memento ink and colored with Copics. Then I cut out all the shapes using the matching dies, Stickled the wings and assembled. Finally I added the sentiment and gumdrops. I hope you’ll play along with us! Please check out the YNS Challenge Blog for all the rules and more inspiration. TFL! I used a bunch of products from YNS – the Oh, Shoot! is from Jungle Critter Crew, the targets are from Dots and Hearts, the I forgot is from Funny Farm Animal Sentiments and finally the arrow die is from the Awesome Arrows Die Set. Whew! That was a lot! You can get lots of YNS inspiration from all over the place: Facebook, Pinterest, the YNS newsletter and the YNS Challenge Blog. Also please check out the YNS Blog to see all the projects made just for today! Also, if you leave a comment, you could win a YNS stamp set of your choice! There’s a special to celebrate Karen giving birth to her precious little girl! Thanks for stopping by and I hope you were inspired to break out some of your YNS goodies and play! January YNS New Release Hop! Hello and welcome to the Your Next Stamp January New Release Blog Hop! Love is in the air this month with some fabulous new Valentine stamps and dies! The hop begins on Kerri's Blog, and if you've been hopping along you should have arrived from Thanh's blog. You have until Tuesday, January 7th at midnight (EST) to hop and leave comments for your chance to win some awesome prizes! As an added bonus, every stop along the hop has a secret prize! It could be gumdrops, a YNS stamp of choice, a YNS die of choice or a YNS gift certificate!!!! WOW!!! I love that you can’t even tell she was entirely pink before I colored her! As always, Karen is offering an amazing hop special! You will receive 15% off your entire order including sale items through January 10th! Now it's time to hop on over to Julie's blog, but don't forget to leave a comment before you go! Happy hopping and shopping!